Fire & Ice offer a large range of heat lamps from Hatco, International Catering Equipment and Woodson. Our Bonnie, Clyde, Henri and Rannio hanging heat lamps are ideal for operators seeking a more stylish heating solution. 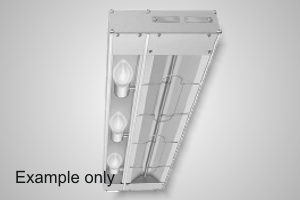 For a more conventional approach choose from our selection of Hatco heat lamps. Available in a variety of configurations and sizes, these heat lamps maintain serving temperatures longer without cooking food.